Have You Laughed at Yourself Lately? If one Googles, “Laughter is the best medicine,” lots of entries come up. One such entry is, “Laughter is the Best Medicine” at http://www.helpguide.org/life/humor_laughter_health.htm What a delight it was to see this, repeating how many areas of your life, spirit, and health can improve through the use of humor and laughter. Please go there and read this refreshing article. Norman Vincent Peale states: “It is of practical value to learn to like yourself. Since you must spend so much time with yourself, you might as well get some satisfaction out of the relationship.” Please check out some of his books, especially, “The Power of Positive Thinking.” It helps to change your perspective. That is an accurate description of how I feel about laughter and its absence. That is why I look for the lighter side of things in spite of pain, enduring illness, sadness (which is appropriate for a time, but then you have to let it go), depression (feeling down for long periods of time), growing older (and seeing how very much I am no longer capable of doing or must do much less), etc. For every reason under the sun, there are many reactions possible. I have to admit that I cannot always respond well, lightening up and getting on with life, but it is my ultimate goal and ideal. I strive very hard to make it workable in my life. I put some music on and dance around, just experiencing the joy of movement. I do yoga. I do my physical therapy exercises religiously and go to the physical therapist as needed. I exercise daily in some way. I love the endorphins that gives me. My message is a simple one: No matter what you have got that is eating at you, laughter and humor can improve your heart and mind so you can deal with life more effectively. All you have to do is seek to experience it in your life, in whatever way that suits you. Are you willing to turn loose of the problem that is choking the life out of you and look for another answer? It is your choice — use it wisely. My Mom at 96, Still Laughing! What a joy that was to experience! “Good Morning, God!” or “Good God, It’s Morning!” ? What is my attitude when I open my eyes for the first time each day? Is it a Good Morning? 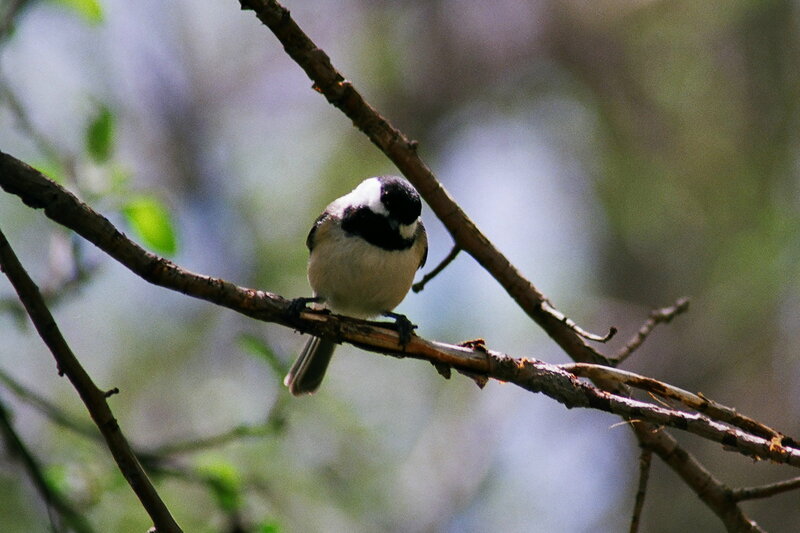 This picture of a little chickadee is in my bathroom, asking me that very question. Attitude affects and effects perspective, always. AFFECT is defined as influence; produce a change in; to move or stir the emotions. EFFECT is defined as the power or ability to bring about results. PERSPECTIVE is defined as a specific point of view in understanding or judging things or events, especially one that shows them in their true relations to one another. You may ask me why this is important. The answer is a simple one: How we view our world and interact with it begins with the second we open our eyes. Our first waking thoughts “set our sails” and will determine our journey for the day..the winds that come, as they always do, will catch those sails and blow us completely off our intended course unless we first set them properly and then adjust them as needed. Is your world a fright-filled one where you have to turn on the morning news to get your first dose of negativity or pick up your newspaper to do the same? Or do you get a fresh cup of coffee and sit down out on the patio to quietly greet the day? All of your first actions in the morning will influence the rest of your day. You control your reactions to what happens to you by starting to make small changes in your schedule to accommodate new beginnings. Are you willing to take that tiny amount of time to make a difference in your life?